Priced to sell! 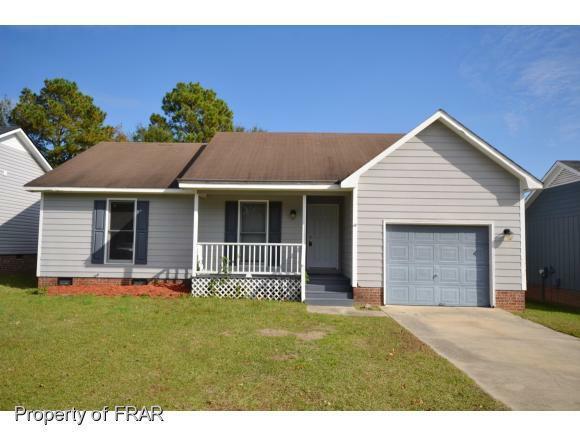 3 Bedroom home located minutes to shopping, restaurants & a quick drive to Ft.Bragg.Home wood laminate flooring in the vaulted great room and all 3 bedrooms. Spacious eat-in kitchen w/all appliances. Fenced backyard w/a covered back porch. Single car garage. Jennings Farm $75,000 3BR/2BA home in a great location minutes to shopping & restaurants and a quick drive to post. Wood laminate flooring in the vaulted great room & all bedrooms. Spacious eat-in kitchen.Fenced backyard w/a covered deck & outdoor storage. Directions: Raeford Rd, Right On Skibo, Left On Cliffdale, Left On Jennings Farm Rd.